"How can I get involved?"... you may be asking yourself. It's easy. Research Puppy Mill on the internet. 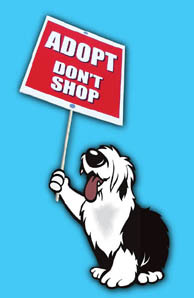 Stop in at local pet stores in your area that sell puppies and ask where they come from. Ask for the names of the breeders. Go research those breeders on the Internet. Chances are you too will find the same information we did, draw the same conclusions that we have and want to see this deceptive selling stopped. If you're in the Chicago area, join us at one of our peaceful and legal demonstations. The last demonstration was yet another success!. A big thanks to all who were able to make it. Our next demonstration will be Sunday, December 23rd from Noon to 2pm. If you're not in the area, find others in your area and start your own demonstations. Remember to stick with information and facts that you can back up, be peaceful, stay on public (city) property, and work with your local law enforcement. We always let them know when we will be there and they frequently drive by or even sit there the entire time to ensure that everything goes OK and that we are not harassed while exercising our first amendment rights. Donate time by volunteering with your local animal shelters. Check with PetSmart or PetCo stores as many shelters do adoptions through these stores and the shelters can always use an extra hand. Consider fostering a dog until it is ready for a permanent home. Contact your local officials and work with them to make sure that stores selling animals from Puppy Mills are not allowed in your city. Enact local ordinances... or even laws at the state level. Have more "how to help" suggestions? Let us know via the Contact Us button and we'll add them.